Midway Atoll, one of the most remote islands on earth, is a kaleidoscope of geography, culture, human history, and natural wonder. It also serves as a lens into one of the most profound and symbolic environmental tragedies of our time: the deaths by starvation of thousands of albatrosses who mistake floating plastic trash for food. The images are iconic. The horror, absolute. Our goal, however, is to look beyond the grief and the tragedy. It is here, in the middle of the Pacific Ocean, that we have the opportunity to see our world in context. On Midway, we can not deny the impact we have on the planet. Yet at the same time, we are struck by beauty of the land and the soundscape of wildlife around us, and it is here that we can see the miracle that is life on this earth. So it is with the knowledge of our impact here that we must find a way forward. 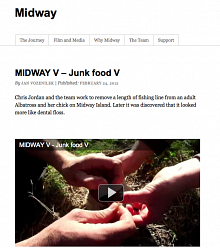 For more information on the project, visit Midway Journey.